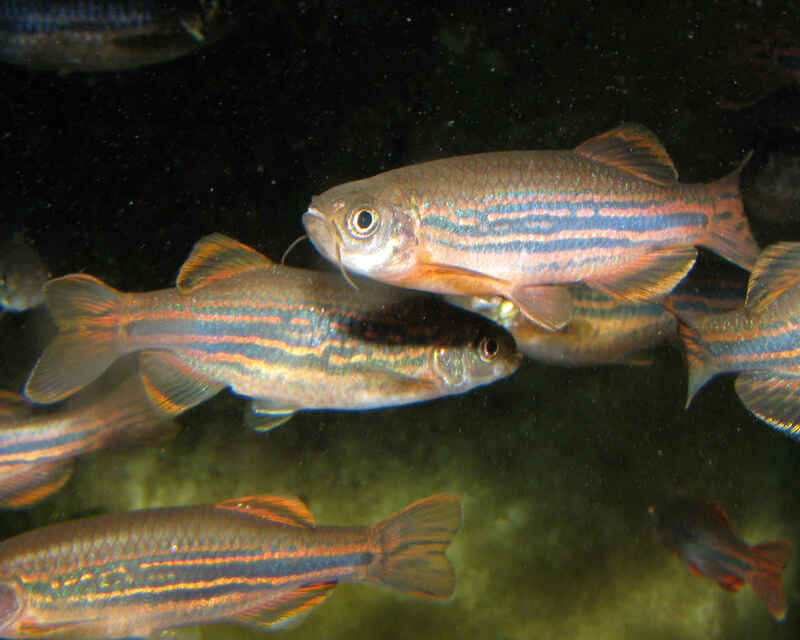 Danio meghalayensis were first described by Sen & Dey in 1985. It was once thought to be synonymous with Danio dangila, but has since been confirmed by Dr Fang Kullander as a species in its own right. The name is derived from their collection location of Meghalaya state, India. These fish typically inhabit mountain streams at an elevation of 4000 feet above sea level. As such, they are sub-tropical and prefer cooler water conditions. I was very fortunate to get some of these fish as here in the states they are very rare. 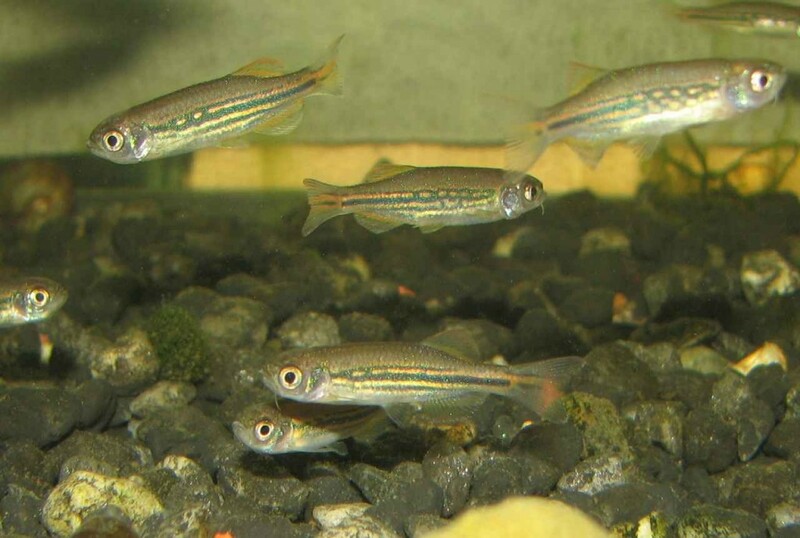 Danio meghalayensis is a shoaling species that should be kept in groups of 6 fish or more. Very hardy and undemanding, they will accept most anything offered in the way of food. They are very good eaters, and can become quite boisterous at feeding time. I normally feed mine a varied diet of slow-sinking granular foods, frozen foods such as blood worms, Repashy Soilent Green gel food, and various live foods such as daphnia, and mosquito larvae. They are not to picky about water parameters, but general do best in water with a pH range of 6.0-7.5, and hardness of up to 18 degrees. As stated above, they prefer cool water in the 65 to 75 °F range. As summer time temperatures in my fish room can sometimes get rather warm, I have kept them in water as warm as 85°F for short periods of time. It is important to keep the water well oxygenated, well-filtered and with a good flow rate. From the first time I saw these fish at Swiss Tropicals, I just knew I had to have them. After Stephan, the owner of Swiss Tropicals, told of how he had hand carried these fish home from Aqua Global in Germany I wanted them even more. To the best of my knowledge, these were the only Danio meghalayensis in the USA. When Stephan found he was going to be relocating and would not have time to work with these fish he agreed to part with them. I received 8 young adult fish from Stephan, 4 males and 4 females all in top condition. When I purchased these fish, it was with the full intention of spawning them. I was soon to discover that there was not much info to be found about spawning these fish, and what was available said that they were considered trickier that other Danios to successfully spawn. 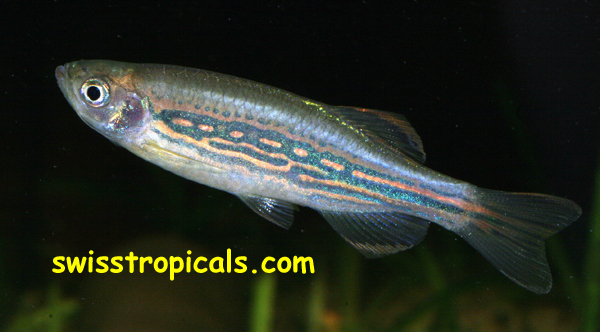 Danio meghalayensis are different from many other Danios because in a breeding group of fish there will be a dominate male. 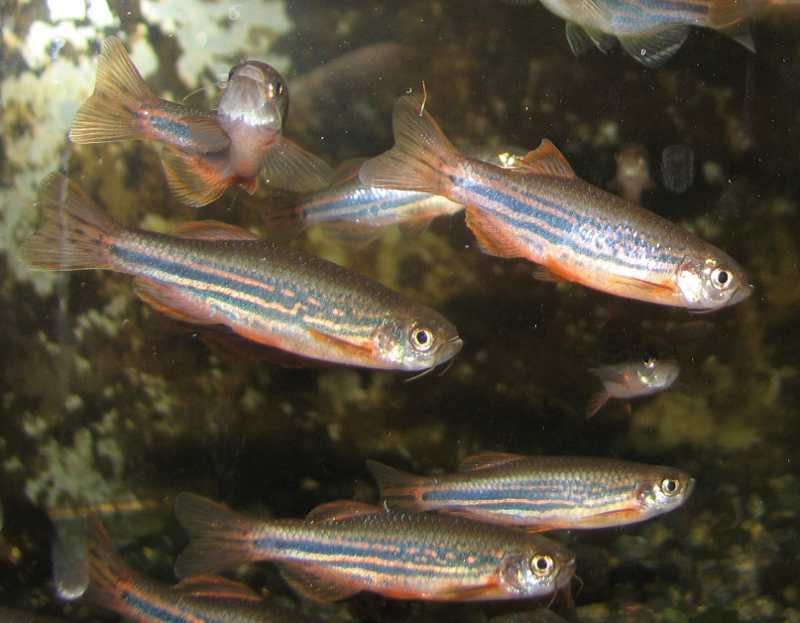 While all of the male fish will display red edges on their fins, the dominate male will display much more red and become brightly colored red for several days prior to and after a spawn event. 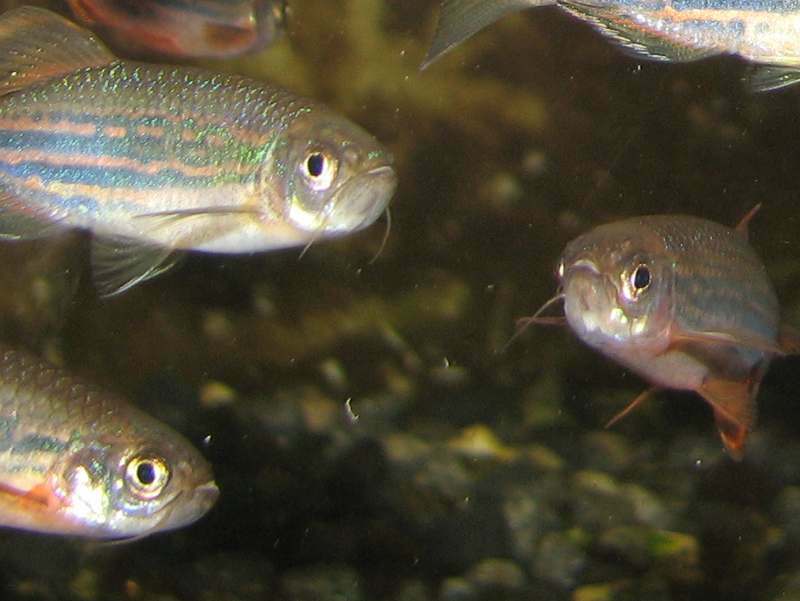 The female fish are slightly larger than the males and much fuller bodied. They have white edging to their fins. Spawning these fish turned out to be quite the adventure. I spent the first month or so trying typical egg scattering fish breeder tactics. The males and females were separated and conditioned with lots of live and frozen foods. 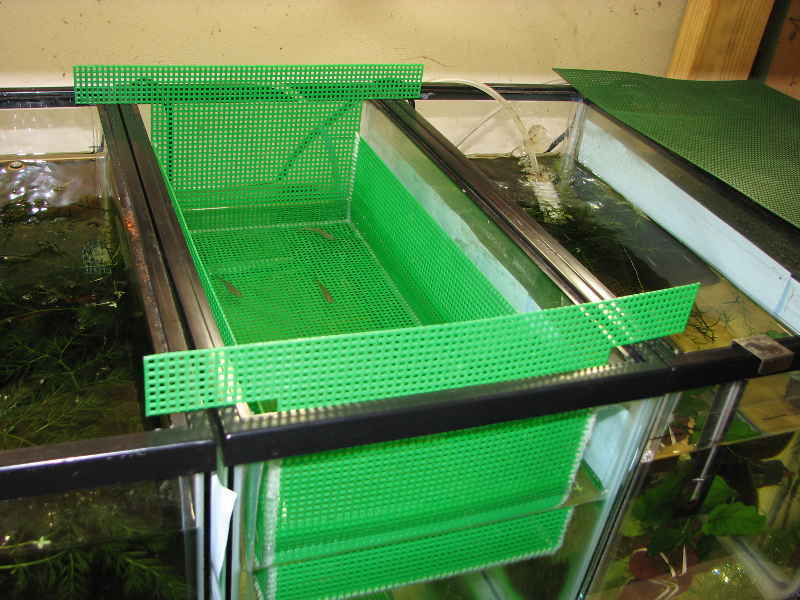 After about a week they would be introduced into a tank with a spawning basket. Strike one – this approach produced no spawning activity. Next up, I supplied the fish with a breeding dish filled with Java moss. 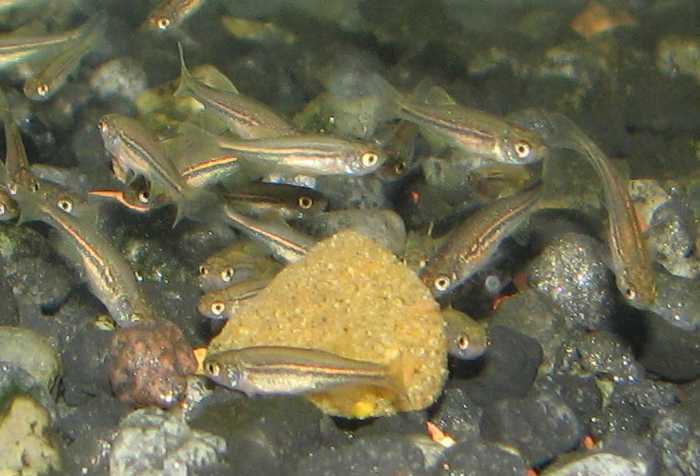 Quite often a bit of plant material or a spawning mop will entice Danios to use it as a spawning site. While I did not separate the males and females at this time, I continued to feed lots of live and frozen foods to keep them in breeding condition. Strike two – no spawning activity using this method. Well as the old saying goes, “Third time’s the charm”. I moved the fish into a 20 gallon long with very course black gravel. I removed the breeding dish, but left the moss in a back corner of the tank. The fish continued to ignore the moss, but one afternoon just shortly after turning on the lights in the fish room and doing a large water change they spawned. It was towards the end of May and a thunder storm was moving through the area at the time. During the spawning event, the females would burrow into the course substrate and the males would follow. It was a group event with all 8 fish participating. Being rather large and boisterous fish, an occasional egg would fly out and quickly be consumed by a temporarily resting fish. The spawning lasted about an hour after which I removed the adult fish to another tank. The video below was shot just after moving the fish into another tank after they had spawned. The fish are still very active and showing their spawning colors. 48 hours spawning, the fry began to hatch. The tank was unheated with the water temperature running around 70 degrees. Over the next 2 days, more and more fry began attaching themselves to the glass and after another 48 hours the first fry became free swimming. For the first week the fry were fed green water and 0-50 micron sized Golden Pearls. The second week they were started on newly hatched baby brine shrimp along with screened daphnia. I also started doing daily 80% – 90% water changes on the fry tank. The third week saw the fry starting to eat Repashy “Soilent Green” gel food along with newly hatched baby brine shrimp and daphnia. They grew very quickly and at 30 days old they were 3⁄4 inch in length. These fry turned out to be very glutinous eaters and I managed to kill around 20 of them by giving them too many daphnia. Normally you can just put a large portion of live food into a fry tank and the fry will eat it over the course of the day. Not these fish, they would literally eat until they died. In almost 50 years of raising fish I’ve never seen anything like it. As they were eating it well and growing very quickly on the Repashy gel, I weaned them off of the live foods by the time they were 12 weeks old. By this time they were starting to look like miniature adults. 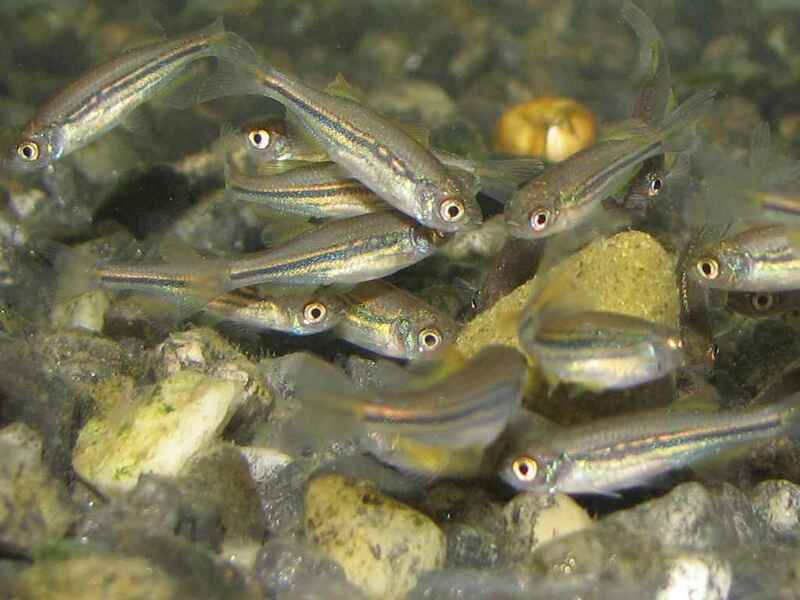 As a result of this successful spawnign, I can proudly say we have around 100 Danio meghalayensis in the USA now. With a bit of luck those numbers will continue to grow and this beautiful fish will find it’s way into many more aquariums. Sorry, these fish are currently Out of Stock.